A 1940s gumshoe is the star of Shadow State, a noirish, private detective-themed video slot from WMS. Played using a 5 reel, 20 payline game engine, it comes with superb design and plenty of extras. They include added wilds, respins with sticky wilds and a pick me round. There’s also a free spins feature where gathering evidence can deliver multipliers of up to 10x. Head to the big city from between 20p and £100 per spin. We’ve not always been kind to the designers of WMS video slots but they’ve created something pretty special here. The setting is a 1940s cityscape. The rainy, black and white backdrop gives the action a gritty feel. On the reels you’ll see A to J royal values as well as case files, whiskey, guns and police badges. The Shadow State logo is the most rewarding of the standard symbols. Land 5 of these on 1 of the game’s 20 paylines and you’ll receive 10 times your bet. Drive By Wilds feature – this can hit at random on any spin. A car pulls up and fires bullets at the reels. Any symbol that’s hit by 1 turns into a wild. A new payout then follows. Locking Wilds feature – these too can arrive at random. On offer are 4 free spins with wilds that hit locking in for any spins you have left. Detective Office Picker feature – this is a variation on the pick me round. You’ll be shown 3 clues at the bottom of the screen. Move them to the ? positions. Make a connection here and you could land an instant coin win or trigger the main feature round, the Bonus Bar Free Spins feature. You can also trigger the Bonus Bar Free Spins feature by landing 3 scatters on the same spin Land and you’ll get a respin and a second opportunity to land the all-important third. Once live you’ll be awarded 8 free spins. There’s scope to add to that though by collecting Evidence symbols. Land 3, 6 or 9 them can deliver another 3, 5 or 10 free spins. The Evidence symbols can also award multipliers which can boost payouts by 3x, 5x or even 10x. Some of WMS’ brick and mortar-style video slots have left us pretty underwhelmed. Shadow State proved to be a very pleasant surprise. The smoky jazz soundtrack and the comic book visuals are excellent. The gameplay impresses too. The 3 randomly hitting mini modifiers keep things galloping along in the base game and the free spins round offers plenty of potential thanks to the multipliers – up to 2,500 times your bet with the 10x multiplier. If you’re a film noir fan, you’ll find plenty to enjoy here. 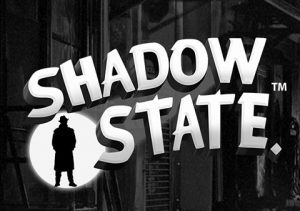 Even if you’re not, the classy design and range of extras make Shadow State well worth investigating. I also recommend you try some of WMS’ other land-based conversions with Forbidden Dragons a good place to start.